Nearly 100,000 Russian soldiers have wrapped up the country's biggest military exercise of the year, practicing to "contain" a conflict in Central Asia. The scenario of the exercise, said Colonel-General Vladimir Rudnitskiy, the commander of Russia's Central Military District, was the "containment of an international armed conflict in the Central Asian strategic direction." The exercise was called Center-2015, and the Center name has been in the past used for joint CSTO exercises; it's not clear why no other Central Asian states were involved this time. 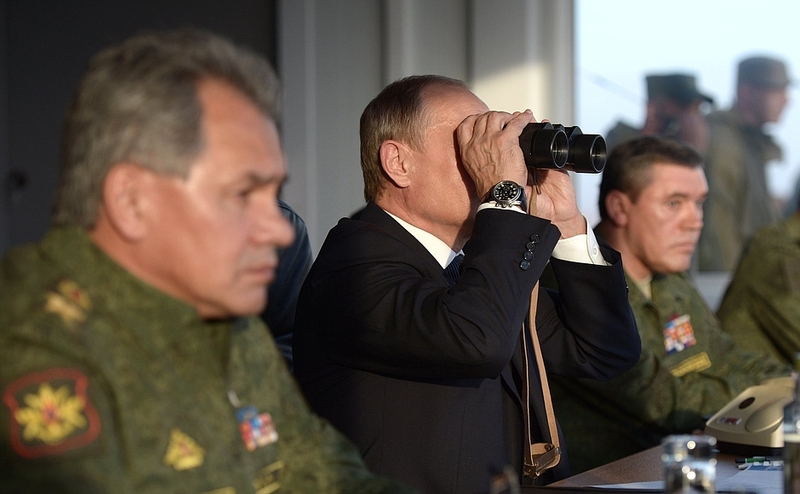 In one evocative touch, Russian President Vladimir Putin watched the final stage of the exercise from Orenburg. Orenburg is best known as the garrison town from which the Russian empire conquered Central Asia in the 19th century. The CSTO did hold joint exercises in Tajikistan earlier this year, albeit at a much smaller scale, with about 2,500 troops taking part. One thing that Center-2015 had in common with those exercises was the use of conventional forces to combat "terrorist" groups. Among the episodes in the scenario of Center-2015: a group of "bandits" hiding in a village with the Russian forces sending "dozens" of tanks and artillery pieces in response; bandits bringing drugs from Tajikistan; and defending oil-extraction infrastructure in the Caspian from terror attacks. It's perhaps telling that Putin's comments at the Orenburg event -- also attended by military attaches of 40 countries -- focused on the performance of Russia-produced weaponry. "The exercises demonstrated the high tactical-technical characteristics of modern weapons systems and thereby yet again proved the significant potential of our defense enterprises," he said. Putin has increasingly focused on the export potential of the Russian defense industry as the country's economy suffers from the drop in oil prices.